There are many different software available using which you can share your android mobile device screen with your PC or laptop. 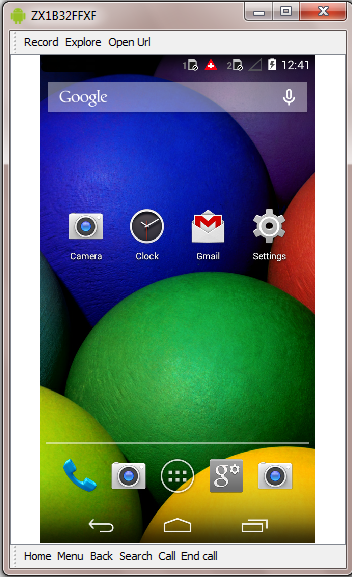 androidscreencast software Is one of them to control an android device remotely. Using androidscreencast desktop software app, You can mirror your android device's screen In your PC and also you can record the android device's screen activity video In your PC. Let's learn how to Install and use Androidscreencast software to record video of android mobile device's screen activity. We will use It In android app automation using appium. Java 5 or later version should be Installed In your PC. View JAVA/JDK INSTALLATION steps. 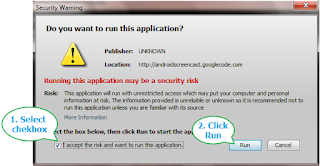 Android SDK should be Installed In your PC. View SDK INSTALLATION steps. Android device should be connected with PC and detected using "adb devices" command In command prompt. View ANDROID DEVICE CONNECTION steps. 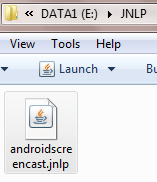 We need androidscreencast.jnlp file to launch androidscreencast software Interface. You can download It from THIS PAGE or use this direct download LINK. It will download androidscreencast.jnlp file. Put It In your desired PC drive location. I have put It at E:\JNLP location. You need to add bellow given URLs In Java Exception Site List. Click On Configure Java. 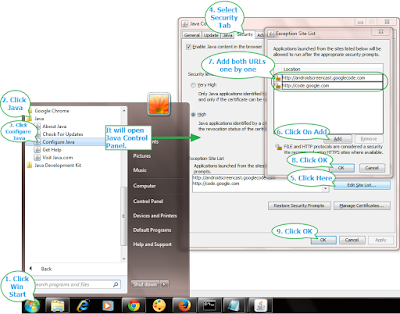 It will open Java Control Panel dialog. On Java Control Panel dialog, Select Security tab. Click On Edit Site List button on Security tab. It will open Exception Site List dialog. Add above URLs one by one In list of Exception Site List dialog by clicking on Add button. Click on OK button of Exception Site List dialog. Click on OK button of Java Control Panel dialog. Steps with Image description are as bellow. 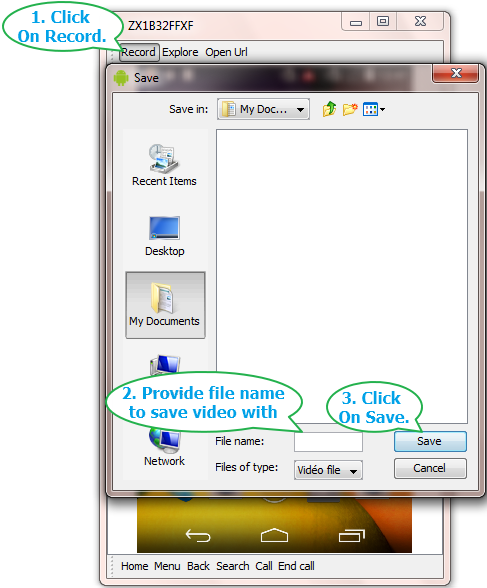 Open JNLP folder where androidscreencast.jnlp file Is located. Press keyboard's CTRL + Shift + Mouse Right Click. 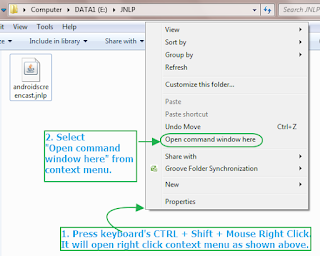 It will open right click context menu as shown In bellow given Image. 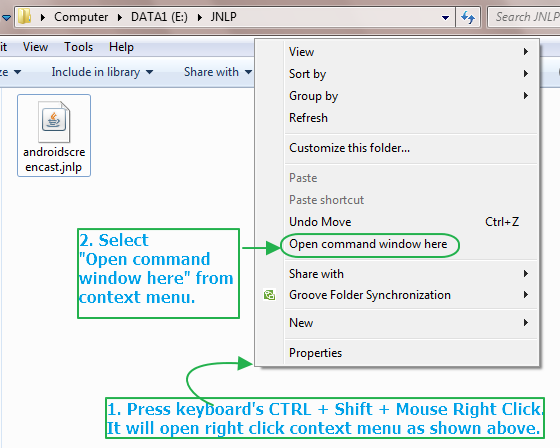 Select "Open command window here" from context menu. 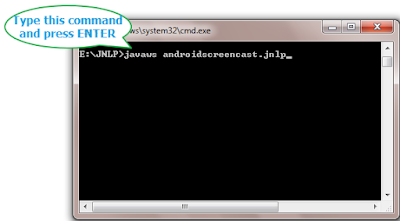 It will launch command prompt with navigation to current selected JNLP folder. Type command javaws androidscreencast.jnlp In command prompt and press keyboard ENTER button. It will show you dialog as bellow on first run. Select check box and click on Run button as shown In above Image. It will launch Androidscreencast and show your connected device's screen as shown In bellow Image. Now whatever you do In your mobile screen, It will display In Androidscreencast Interface. Click on Record button as shown In bellow Image. It will open Save file dialog. Select your desired location to save recording video file, Provide file name and click on Save button. It will start recording your mobile devices screen activities. To stop recording, Once again click on Record button. It will stop screen recording. It will create .mov file at your selected location. This way you can mirror your android mobile's screen In PC and record video of screen activities using Androidscreencast software. The desktop app Androidscreencast doesn't work on my Samsung Galaxy S7. The displayed screen is yellow with low resolution and stripes. Are there any other programs that do the same job? 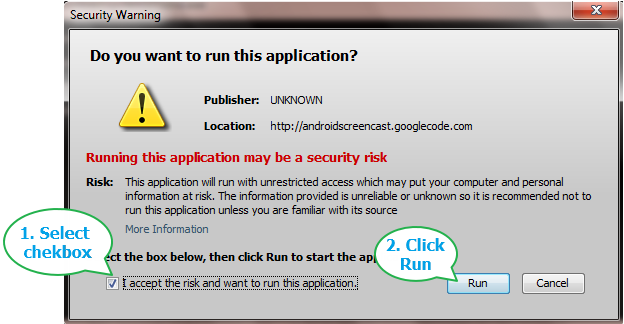 i have followed the steps for Android Scrrencast but this did not work in my windows 7 when i used the emulator . The screen is blurred and unclear. Let me know if there are any other depenedencies or we have to take the updated android jnlp jar . kindly help on this issue . Does it work for android device connected to MAC machine? Androidscreencast download link is broken. Could you please share any other path ?